Brother Andrea Pozzo, S.J., was also known by his Latin name Andreas Puteus. He is famous within the Jesuit world for the artistic works he completed in Rome and which exist as precious legacies of a special talent applied for the glory of God. These works include altars, frescoes and ceiling paintings, and collectively these works made him one of the more famous Jesuit artists of the Baroque period. Among these works in Rome is the famous ceiling painting of “the triumph (or apotheosis) of St Ignatius”, the founder of the Jesuits, which is in the church of the same name (Sant’ Ignazio). 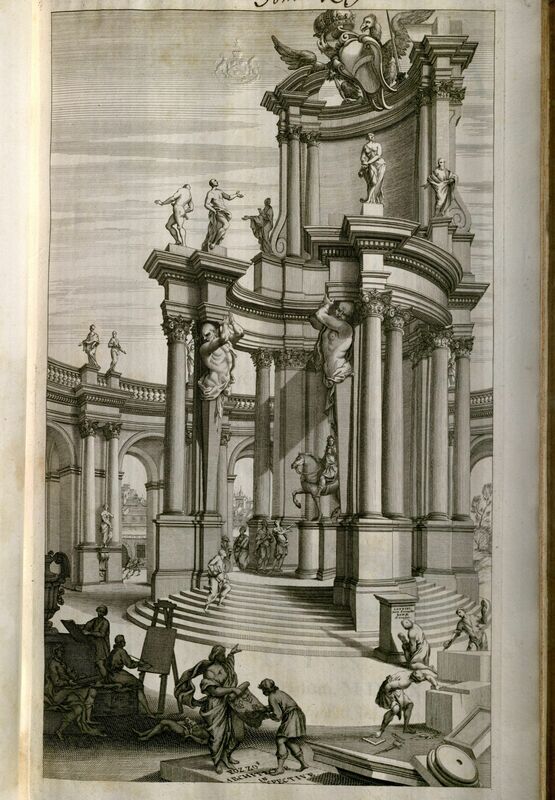 St Ignatius is shown rising up to heaven, elevating beyond the confines of an elaborate building, which shows figures from scripture and allegorical illustrations of all the places where Jesuit missionaries have been working, including Asia, Africa, America and Europe. The result is a stunning and fantastical – in the true sense of ‘beyond reality’ – rendition of early Jesuit history and the Jesuits’ collective hopes for the future, their own eventual union with God. What makes this massive painting more remarkable, however, is the fact that it is painted on a flat ceiling. 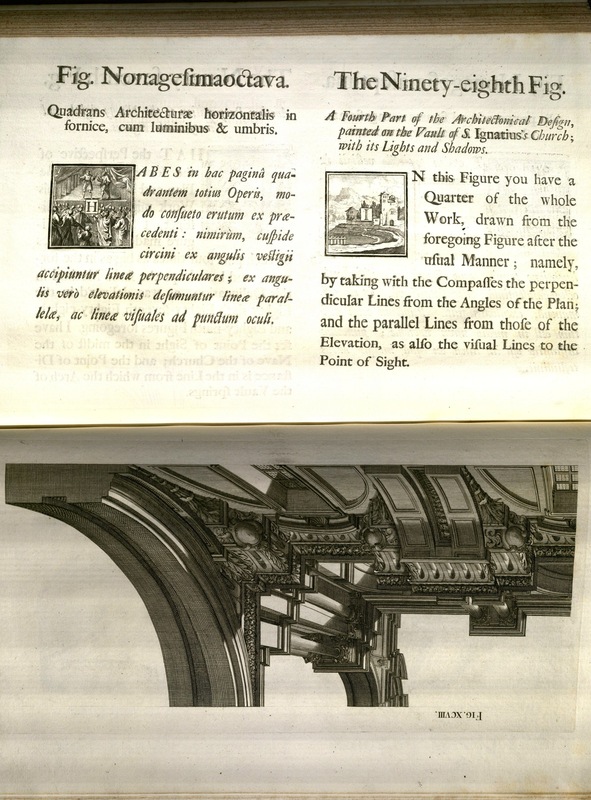 Pozzo employed highly sophisticated theories of perspective to achieve a stunning trompe l’oeil. If visitors stood on a particular spot and gazed upwards their eyes were tricked into believing that they were looking at a curved ceiling. Pozzo also finished works in the other great Roman church of the Jesuits, the Gesù, and in Vienna, Austria. 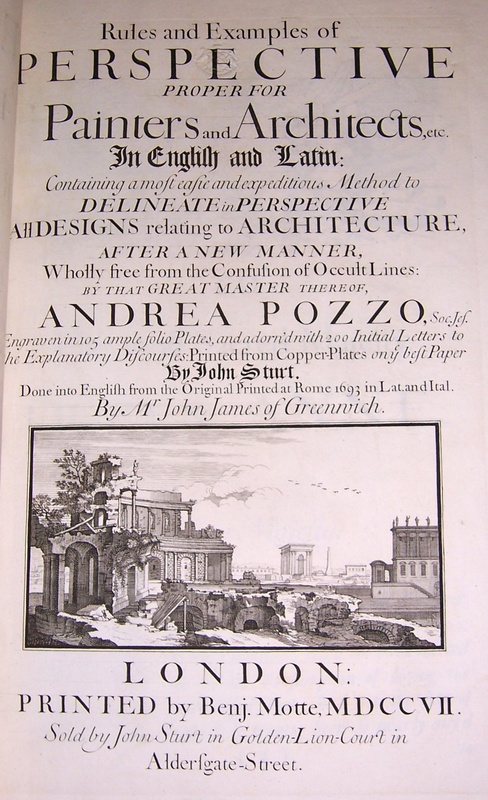 Pozzo’s great understanding of perspective was recorded for posterity in his work Rules and examples of perspective, proper for painters and architects, etc., which was originally published in Latin in the late seventeenth century, but quickly translated into English and other languages. Given the international reach of the Jesuits and the fact they were active builders and decorators of churches throughout the world, it is not surprising that this work was also translated into Chinese as well, where it proceeded to educate Chinese artists about Western theories of perspective. There is an ongoing conversation about the extent to which Western perspective had much influence on Chinese styles of painting, but whatever side of the conversation one supports, it is true that Pozzo’s voice was a significant one all the same. Jesuit histories were translated into many languages. Here Bouvet’s description of the Kangxi Emperor is attached to a report on Russia. As the capital of China since the Ming dynasty, this was an important destination for Ricci and his fellow Jesuits. Ricci and his fellow Jesuits relied on their learning, including mathematical principles, especially as they had been taught these by Jesuits like Clavius.